There’s more to food than just taste. Or so that’s what I’ve learned in my six years of studying nutrition science. Food provides our bodies with the nutrients it needs to function, just like fuel to a car. But what foods constitute as healthy? How can you maintain a healthy diet without compromising taste and without having to follow the latest fad diet (or skipping dessert)? That’s where the 2015-2020 Dietary Guidelines for Americans come in. The guidelines have clear implications for federal nutrition policy, influencing everything from the national school lunch program to the advice you get at the doctor’s office. Instead of reducing sugar intake, the new guidelines give us a sugar LIMIT. It recommends reducing added sugar (the kind put in foods during processing, not the natural kind found in fruit and dairy) to no more than 10 percent of daily calories. For someone on a 2,000-calorie diet, that’s about 50 grams or 12 teaspoons of added sugar a day. Most Americans get twice that. There’s now no recommendation to limit dietary cholesterol (they used to recommend limiting it to 300mg per day) because new research suggests that the cholesterol we get from food doesn’t contribute to high blood cholesterol levels. There is a focus on choosing plant-based proteins by replacing meat, poultry or eggs with seafood twice a week, and replacing some meat or poultry in mixed dishes with legumes, nuts, and seeds. When looking at my own family’s eating habits, I find that there’s greater value in making small changes in our diet and lifestyle. For instance, I love making spaghetti sauce and adding in chopped mushrooms and carrots. We generally keep it to one sweet item per day and don’t have sugar sweetened beverages, except for special occasions. I also try to serve more unsaturated fats, especially those found in vegetable oils, fish and nuts. That being said, I certainly won’t be keeping a score sheet on whether or not my family eats perfectly. I want my family to enjoy meals together (and an occasional floret of broccoli, too)! Katie Serbinski, MS, RD, is a registered dietitian and Mom of two boys under two. She’s the founder of Mom to Mom Nutrition, a healthy food and lifestyle blog where she shares her “me time” with other health-minded parents. On her blog, you’ll find simple, family-friendly recipes, tips for new parents, and realistic nutrition advice. Connect with Katie through email Katie@MomToMomNutrition.com or Twitter @MomNutrition. 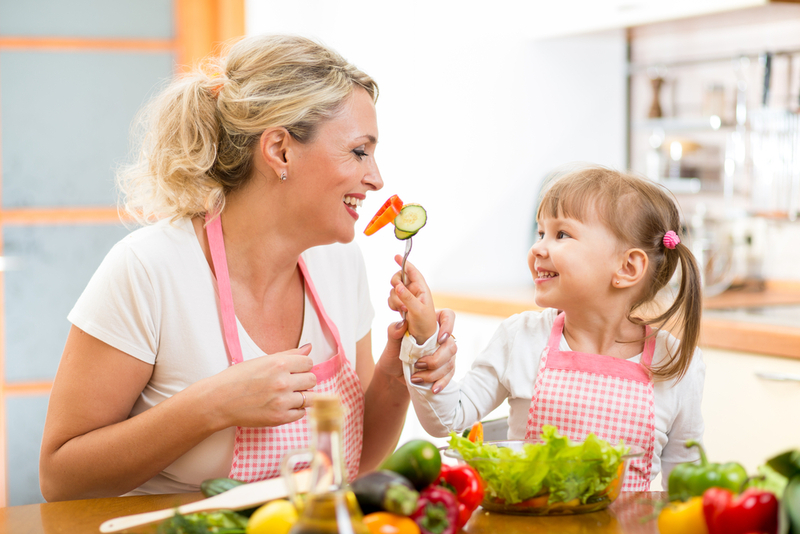 In search of healthy recipes to make for your family? Check out our Recipes tab!